An Apple store in China. China Telecom Corp., the No. 3 player in the Chinese mobile market and the world’s largest CDMA operator, has managed to add 9 million subscribers in the third quarter and 26.4 million so far this year. That’s almost twice the 4.7 million added during the quarter by the top three carriers in the U.S. No wonder mobile players such as Apple (s aapl) and Amazon (s amzn) are so eager to get into the market. China Telecom, which trails China Mobile’s 600 million subscribers and China Unicom’s 181.6 million customers, said 7 million of its 9 million new additions for the quarter subscribed to 3G services. The Chinese are at the early stage of 3G mobile broadband adoption, and are also in the middle of a huge nationwide fiber build out. So it’s not only the huge population drawing mobile firms’ eyes, but the growth in mobile broadband adoption. Unlike the U.S., where growth is now coming from people carrying multiple lines and adding machine-to-machine connections, the Chinese market is far from saturated. According to Wireless Intelligence, the analyst arm of the GSM Association, by the second quarter of 2012, there will be 1 billion Chinese using mobile phones — about 74 percent of the population– and a quarter of them will subscribe to 3G services. 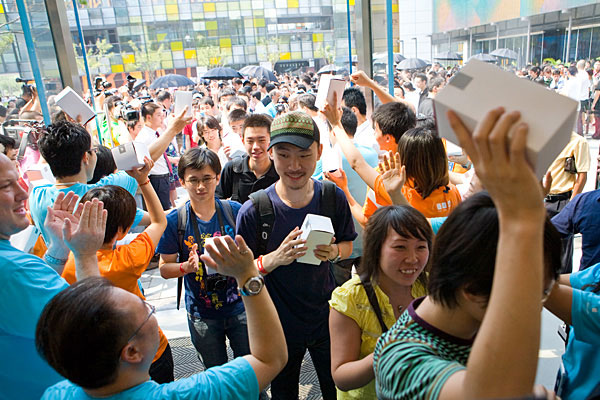 With China Telecom expected to get an iPhone, the growth possibilities are pretty substantial. Heck, even on an unsupported network the Chinese are fans of the iPhone. For example, UBS China Telco Analyst Jinjin Wang estimates that in the first half of 2012 China will add a significant boost to Apple’s earnings. Another UBS report notes that Amazon is also planning a big Chinese push, hoping to launch the Kindle there. Onetto, Senior Vice President, Amazon IT in an interview told Sohu that AMZN is in discussion with Chinese regulators over copyright issues with regards to Kindle products. Separately, AMZN changed the branding of Chinese e-commerce website Joyo.com which it acquired in 2004. Joyo will now be known as Amazon China. AMZN also announced the opening of a fulfillment center in Kunshan, Jiangsu province. The new fulfillment center is AMZN’s largest outside the US and occupies an area of ~1.3MM square feet. As with all U.S. efforts to expand into China, the lure of growth is offset by government interference and concerns over counterfeiting and IP protection. But when faced with a billion potential customers, it’s no wonder firms believe the risks are worth it. wow, one billion phone users. The West will appreciate the Great Chinese Firewall eventually as those users would would overload the server infrastructure designed for an order lower volume of users. Another reason to appreciate the data dam will come form western countries governments when Apple unveils its mapping service with realistic 3D bird-eye view, concerning over privacy. Yep, history is full of ironies. I gather that Apple has been slow to supply phones to China’s major mobile telecom is due to their 4g modulation scheme, except the old ones, not compatible with the rest of the world. Apple have to tailor specific models with front end design to support them. Reading between the lines seems that will happen with the next iPhone.